DownTown Company’s products offer the best in affordable luxury bed linens. Integrity, design and value is the mission statement. 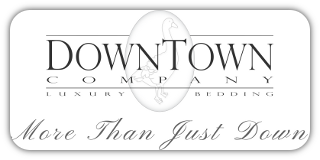 "DownTown" has consistently offered our customers the finest and highest quality down products and most affordable luxury bedding in the world. Ranging from pillows, comforters, upholstered beds and custom silk sheets, the line is manufactured exclusively from fine materials such as Siberian down, Peruvian alpaca, Egyptian cotton and German silk.